Passwords may be assigned to private albums and sets with hierarchical levels of access. Once protected, a site visitor must enter a password to view a private collection. Publish an (optional) public albums page that links to password protected collections. Optional full-site protection method and session expiration control. Password Protect is a plugin that allows you to password protect your entire Koken site or share private, password-protected collections with clients, friends, and VIPs. Out of the box, Password Protect allows you to share private albums, sets, images and videos with site visitors by requiring a password. You may assign a single "master" password for all private collections, unique passwords for individual albums and sets, or a combination of the two for hierchical levels of permission. Once authenticated, private content is displayed using the same theme templates as public content for consistent style, layout and navigation. Alternatively, you may also use this plugin to password protect your entire Koken site. This locks down every page so nothing may be viewed unless a site visitor enters a password. If password protecting individual collections, this plugin also allows you to publish a public index page linking to each private collection. This makes it easy for those who receive passwords to find their collections through your main site. 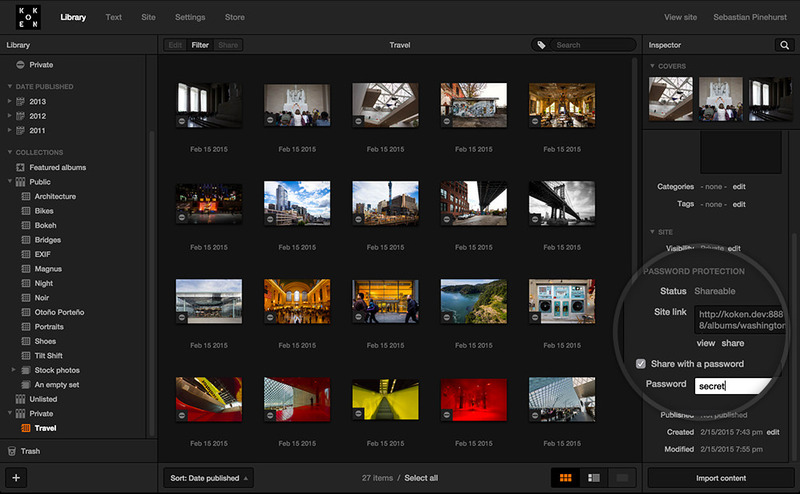 Password Protect fits right into the workflow of photographers and designers who need to share sensitive content with close contacts. Whether you choose to publish both public and private content, or lock-down your entire site, this plugin makes it easy for you to discretely and conveniently share content that cannot be viewed by the general public or search engines. 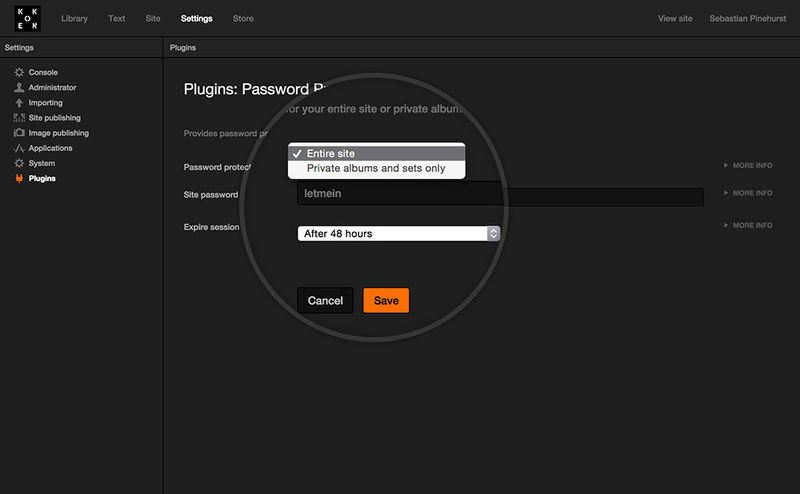 Every Koken theme supports this plugin by displaying a unique login template provided by the theme itself or a simple, clean password submission page provided by the plugin as a fallback. No matter which theme you choose - from the Koken Store or a third party - this plugin is compatible. Follow these steps to begin using the Password Protect plugin. Now click the Setup button to edit the plugin's settings. It's here with the Password protect dropdown (see below) you may choose between password protecting private albums and sets or your entire Koken site (so every page requires a password). Let's begin with albums and sets. Password protecting private albums and sets means that Koken will allow your private Library content to be viewable through your site by entering a password. This is the default plugin setting, as reflected by the Password protect dropdown (see above). Below the dropdown is an input field for assigning a "master password". This password is optional and provides entry to any private album or set. Consider it a "skeleton key" for super important people, like you! Enter a master password (or not), then click Save. Now let's head over to the Library. We're going to password protect both an album and a set to illustrate the differences between the two. To create a new album, click the [+] button at the bottom of the Library's left column. Make sure that "Album" is selected at the top, then assign a title. Just below that, click on More Properties, then set Visibility to "Private" (as shown below). When finished click the Create album button. If you already have a public or unlisted album you'd like to make private, select the album in the Library's left column, scroll the right "Inspector" column down until you see Visibility, click its edit link, then set it to "Private" as shown below. When finished click Done. Note: If your existing album contains content, Koken will ask if you'd like to change all the album's content to private as well. Most people should click Yes..., for this will prevent the content from appearing in other (public) places on your site. In the Library's left column underneath Private you should now see your album. This album is not visible to anyone but you here inside the Library. Click the Share with a password checkbox. A Password input will appear underneath (as shown below). Enter a password in the field, then click anywhere outside. The password will be saved, and the album's status will change to "Shareable". The album may now be viewed through your site with its link and password. If a master password has been assigned, the album's status will display "Shareable with master password" (see below). This album may then be shared and viewed with its link and master password. You'll notice underneath a checkbox for Assign additional password (see above). This allows you to assign an additional password that will also be accepted when the album is viewed (so you don't have to share your master password). Click the checkbox, enter a password in the field, then click anywhere outside. The password will be saved and the album's status will change to "Shareable". To test everything out, click view underneath the link field. A new browser window will open with the private link. Enter a password, and you're in! You may then email this information to others by clicking share underneath the link field. Sets may be private and password protected just like albums, but they function a bit differently because they include a hierarchy. When password protecting a set, anyone you share the set with will be able to access all the albums and sets the set contains. For example, in the screenshot below we have a set titled "Clients". Assign a password to the "Clients" set, share its link and password with a special someone, and that person will be able to browse all the content in "Smith", "Anderson" and "Walter". 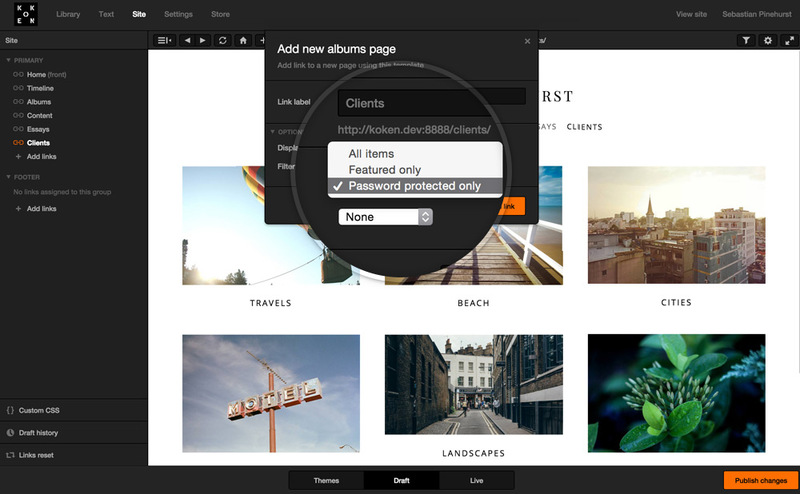 Select any album inside "Clients" and their status will display "Shareable through parent set", as shown below. This means the selected album can be shared by sharing the "Clients" set site link and password, or with a master password, if assigned. To allow access to only one of the albums inside the set, select the album in the left column, then click the Assign additional password checkbox (see below). The password assigned here will work with only this album, not its parent set or sibling collections. When choosing to protect your entire Koken site a password will be required to view any page at any URL. Once authenticated a site visitor may then browse your entire site. Note that with this option, private albums and sets remain private and viewable only to you inside the Koken library. To password protect everything, return to the plugin's Setup page and select "Entire site" from the Password protect drop-down, then enter a password into the field provided. Click Save when finished. From that moment on anyone who visits your site from any URL must enter your assigned password in order to continue. Also on the Setup page (shown above) is an Expire session option to control how long an authenticated site visitor has to view protected content before they're automatically signed-out. By default this happens 24 hours following sign-in or immediately if a password is changed. If you'd like to allow site visitors more time to browse, or sign them out immediately if they close their browser window, you may select an alternate option. Go to Settings > Plugins and click Password Protect's Disable button. If you were protecting your entire site your site should now be viewable without entering a password. If you were protecting private albums/sets, those collections may now only be viewed by the admin inside Koken's Library. If you are password protecting private albums and sets and would like to display a public page that links to each collection, you may do so through the Site editor. To get started, click Site in Koken's main navigation, then Add links in the left column. In the sheet that appears, click the small + button to the right of the Albums template. In the sheet that appears (see above), give your link a name, then in the Options section change Display to Password protected only. Click the Add link button to create the link, then change the link's navigation order in the left column by drag-and-drop, if necessary. Finally, click the Publish changes button at the bottom of the Site editor to publish your new page. This page of protected collections will be visible to anyone who visits your site. 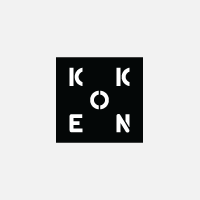 Koken will ask anyone who clicks on an album/set to enter a password to view the collection's content. Fix issue preventing new albums from being created. Fix issue protecting albums with titles containing spaces or hyphens. Fix compatibility with unlisted & private images in public albums. Style modifications to the default login template. Resolved album sign in issue introduced in 1.2.0. Fix signing in to albums with numeric passwords. New option for adding an album listing in Site that shows only your password protected galleries. Improved visibility matching to ensure only content matching album visibility or higher is shown.